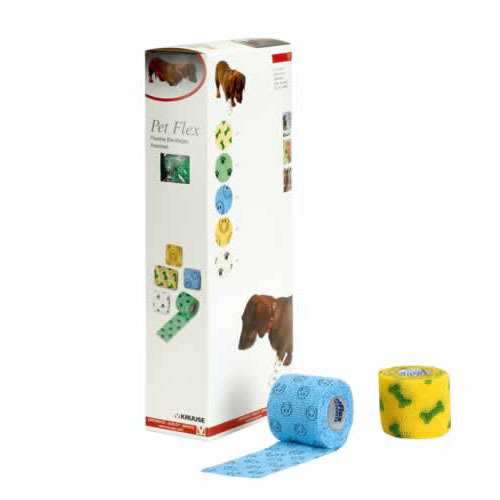 Kruuse Pet-Flex Bandage (5cm x 4.5m) are high quality bandages will not stick to fur, skin or hair and provide controlled compression with non-slip support to secure and protect primary dressing from dirt and moisture. Pet-flex bandages are sweat and water-resistant, maintain their original size and will not shrink on the roll or your dog. Hand tear. No need for scissors. Completely self-adhesive. Needs no other form of fastening. Does not stick to the hair or fur of your dog. Easy to remove with scissors. Great strength, durability and elasticity. Important: All bandages should be applied carefully so as not to restrict the blood circulation.